Mt. 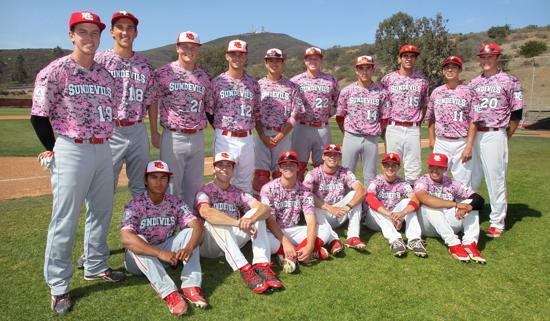 Carmel baseball players and coaches of 2014 model their pink uniforms worn for the team's annual game to benefit cancer awareness and research. “But this game ties us all together,” said Mt. Carmel High outfielder Jake Wexler. What Wexler was referring to is Mt. Carmel’s fifth annual Cancer Game. Sundevils assistant baseball coach Keith Johnson thought of the idea after former Mt. Carmel player Kyle Owsley lost his mother to bone cancer. So Sundevils head coach Chachi Mueller and Johnson decided to play a game as a fundraiser with proceeds going to UC San Diego Moores Cancer Center. This year’s game is Saturday at Mt. Carmel against Palomar League foe Westview. “Our players really get behind this cause,” Mueller said. “And every player is so different. “Daniel Cope is a really good human being, a quality person and a talented player. “Jacob Benson is a smaller kid who has always been told he can’t do things because of his size. He plays with a chip on his shoulder. “Jake Wexler is involved in a buddy program where he works with severely handicapped kids. “Jack Melton is a quiet kid, maybe even a little goofy. But he’s very talented. Players from both teams will wear pink jerseys with the names of a cancer victim on the back. Those jerseys will be auctioned off after the game. “This is really special because we’re playing for more than ourselves,” said Benson, the Sundevils’ shortstop. “There is a great vibe at this game. “Certainly the outcome matters. We want to beat Westview. And they want to beat us. It’s a big rivalry. “But this game is one of the most unique things about being a baseball player at Mt. Carmel. Melton is one of the top pitchers in the county. He can’t wait for the game. “This is one of the really cool things we do as players,” Melton said. “We always have a big crowd, so it’s pretty exciting. This is far from a million-dollar deal. Last year’s game raised about $3,300. Johnson said the goal this year is $4,000. “Jalapenos and Penasquitos Auto Repair donate the food,” Johnson said. “Game Day Sports donates the uniforms. “The community is really behind this. Melton, who has signed to play at Colorado Mesa next season, will play for his 81-year-old grandfather, who overcame prostate cancer and will travel from Palm Springs to see the game. Wexler, who is among the team leaders in RBIs, will play for his great grandmother, who survived breast cancer, and for his father, who survived skin cancer just last year. “Because of my dad, this hits pretty close. It means a lot,” Wexler said. Benson, who is hitting .295, is playing for Maureen Roadman, his college counselor. She’s battling breast cancer. Pitcher/outfielder Jacob Andrada will play for longtime Mt. Carmel boys volleyball coach Patsy Malta, who has fought breast cancer. Cope, a catcher, who is hitting .333 and has signed to play at Cal State Fullerton, is playing for his mother. “She had breast cancer, but is five years cancer free,” Cope said. “We all know someone who has had some type of cancer. Donations: Checks, made out to UC San Diego Moores Cancer Center, can be sent to coach Chachi Mueller at Mt. Carmel High.